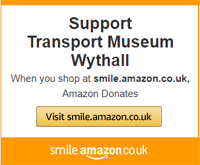 The Transport Museum, Wythall is an established, independent, working museum which first opened to the public in 1980. Its three halls contain remarkable collections of buses and battery-electric vehicles. It is a Registered Museum and an Registered Charity (no.1167872). As such the Museum receives no revenue funding from the Government to support its restoration and conservation work. We are fortunate to have a dedicated group of volunteers who regularly give their time and skills to operate and maintain the museum and its collections. However, we are increasingly reliant on the donations and bequests of individuals and corporate sponsors to fund the museum's activities. The Museum has launched an online shop selling books and collectables. The shopping area also lets you make donations and, if you are a member, you can pay your subscription on-line. Click here for more details. If you are interested in becoming a Member of the Museum click here for further details.